As she launches a national book tour, stoking rumors of a 2020 presidential run, Sen. Elizabeth Warren might be in for a rude awakening in 2018. Once called the “darling of the Democratic Party,” the Massachusetts Senator’s popularity has taken a major tumble in recent months, leading to speculation as to why. A recent poll released by WBUR-FM, which accurately predicted Warren’s 2012 race against Scott Brown, in January found that the just 44 percent of the former progressive champion’s constituents would like to see her reelected. Last week, another poll compounded Warren’s woes, ranking her among the 10 least popular senators in the country—despite her recent public spats with both Senate Majority Leader Mitch McConnell and President Donald Trump, and her recent appearances with Senator Bernie Sanders (who tops the list of most popular senators). The most likely culprit for this fall from grace is Warren’s perceived abandonment of the progressive left—her core supporters—during the 2016 election. The Massachusetts Senator did not issue an endorsement until the primary was essentially over, after which she went on to campaign for the neoliberal Hillary Clinton. Throughout the race, Clinton repeatedly chastised Sen. Sanders and his supporters as “pie in the sky” and misguided for backing policies Warren herself championed. Though she did hold out the longest of any female senator before issuing an endorsement, and had made coy, indirect statements many felt were criticisms of Clinton—it wasn’t enough. 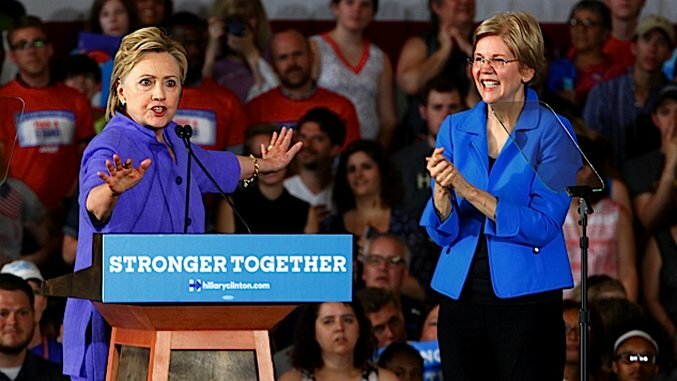 After her endorsement, Warren joined in a chorus of Democrats denouncing Trump for his sexist remarks about women, but avoiding discussions of the primary—even as the email leaks were going on. @WalkerBragman You mean like how I don't trust her anymore? Or that supporting Hillary defied every principle she was supposed to have? Many progressives felt Warren's support could have turned Massachusetts in the Vermont Senator's favor—if not the primary. When it was withheld, progressive voters felt it exposed Warren's fairweather commitment to those causes. Such were the sentiments expressed by Mari Yates, a Boston resident whose parents had suffered during the Great Recession. She told Paste that while she had originally been impressed with Warren in 2012 for her involvement with the Consumer Financial Protection Bureau, her lack of endorsement for Sanders was disheartening. @WalkerBragman I would have had more respect for her, even at the end of the day if she had gone for Clinton at the start. The prevailing wisdom is that Warren was playing it safe so as not to divide the party, or lose her influence or support should Clinton, who was widely expected to win, end up winning. After all, few remember that women voters gave her the edge in 2012. Despite her apparent misstep, Politico recently reported that the Massachusetts Senator likely still has an advantage in the upcoming 2018 election due to a disappointing field of challengers. Additionally, many Massachusetts progressives—including the ones Paste spoke to—are still planning on voting for her. There is something to this reasoning. 2016 aside, the Harvard professor turned Senator is eminently qualified for her job and supremely knowledgeable on issues of bankruptcy and financial regulation. Her courage may have been measured, but her intellectual wherewithal will likely be necessary in upcoming policy battles. Still, at a certain point, Warren must face a reckoning about 2016 because while she’s still vocally calling for Glass-Steagall to return, she ran afoul of many of her die-hard supporters. Trust, once broken, is hard to mend. Yet that is a conversation she seems loath to have. Since the election, the Massachusetts Senator has declined to speculate whether she or Sanders would have fared better than Clinton against Trump. Warren is going to have to do something to shore up her progressive base because, as Dixon pointed out, “Some of the very worst vitriol . . . in this entire election cycle was aimed directly at her . . . Eventually, that rubs off in your polling.” Conservative groups have already begun targeting Warren in anticipation of her possible presidential run. Paste reached out to Senator Warren before publishing this article, but did not hear back. We will update if and when we do.